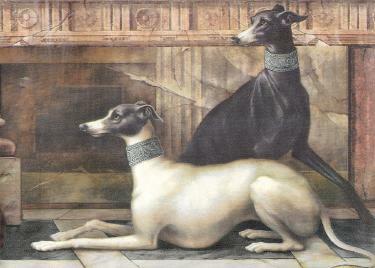 Here is a gorgeous pre-pasted wallpaper border of two exquisite greyhounds and a cheetah. The paste is activated by loosely submerging a strip of this wallpaper into water. Measurements per spool are: 9.5" W x 15 feet long. PRICE IS $35.00, including shipping! Please email Judy Longhouse to order.